US stocks are taking a pause after a sizeable run-up of the last five days. 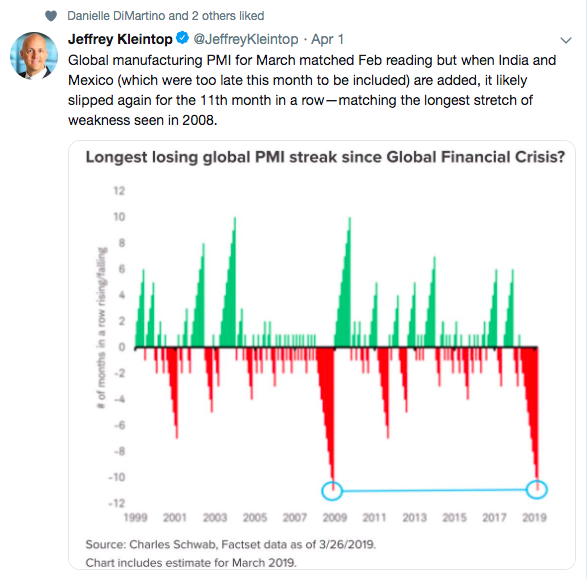 Global economic data is likely not the proximate cause of the monster global rally in risk assets. Today's very narrow range of movement in the SPX, coupled with six-month highs, is the necessary environment to lower lows in spot VIX. 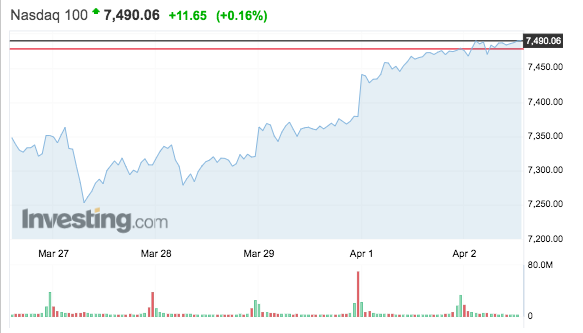 All four of the major US indexes (SPY, DIA, QQQ, IWM) are taking a breather on Tuesday, after an appreciable run-up in share prices over the last week. Spot VIX has descended back to the very low end of its six-month range, while the SPX tracks near six-month highs. Q1 2019 is in the books, and it was a barn-burner for risk assets the world over. Pretty much every major equity index was higher, after a lousy quarterly finish to 2018. Is the recovery "organic", in the sense that it occurred naturally without much in the way of policy intervention? There are several dimensions to this question, but from a purely monetary perspective, the answer would have to be a clear "no". 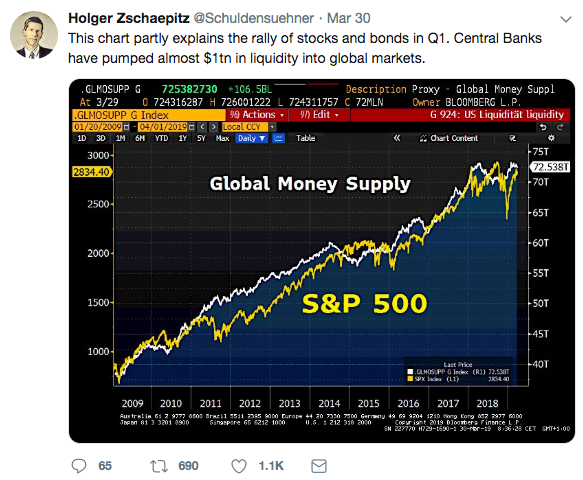 Global liquidity spiked, and furthermore signaling/messaging has grown decidedly dovish, to the point where rate cuts are actually looking more likely than further rate hikes. While stocks are higher, and some global economic data is coming in a bit better than earlier in the year, it merits attention that it's somewhat odd that we're getting back to all-time highs in equities even as the global economy is still off its game. Furthermore, the slump we're seeing is getting perhaps the closest we've seen to a synchronized setback in the economy, though there have certainly been some notable false scares (mid 2015-early 2016 leaps to mind: think plunging commodities (DBC) and rising credit spreads (JNK, EMB)). These are markets: we're never "out of the woods". But the recovery has established itself in spite of the economic data rather than because of it. Lessons learned the hard way. In spite of the remarkable rebounds that equities have undertaken, the vol market is really not the same as it was when short-vol bias persistently built without much resistance. 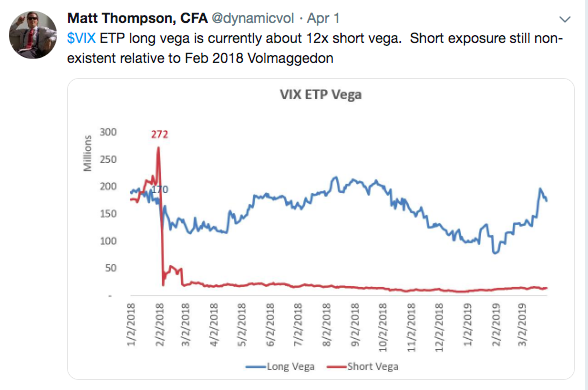 The other side of this is that we appear to be hitting the top end of the long-vega range for VIX ETPs. Especially in a market environment that is tending in the direction of calm and VX contango, this long-vega trend may well swiftly find its way to the low end of the range. 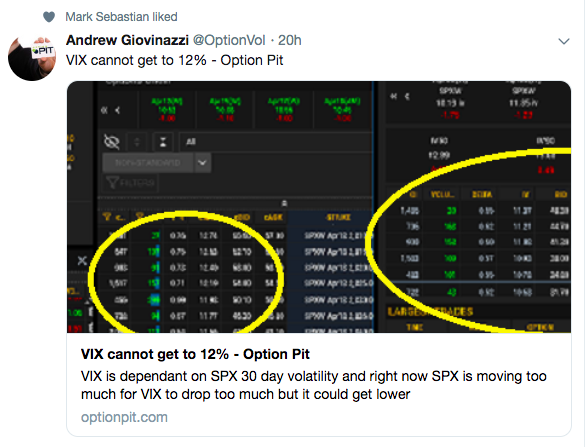 Spot VIX has hugged a pretty tight range so far on Tuesday (13.29-13.68 with a little more than two hours left). Memories fade quickly, and I want to remind readers that the index rather suddenly spiked to the 17 region as early as last week. SPX suffered a 2% loss on March 22: resurgence in volatility is an ever-present possibility, even if the trend is towards greater calm. Despite the spats of the last ten trading days, HV30 is still nestled between a 10 and 11 handle. The VIX9D is trading below spot, suggesting that the forecast is for a relatively sleepy nine-day window ahead of us. The baseline outcome as painted by the term structure is one of falling realized and implied volatilities. We can and have seen reality upset the apple cart, but the term structure sure looks ready to steepen into a state of steeper contango, benefitting vol short position takers (SVXY, ZIV). I'd be curious as to whether any readers view the current set-up differently. So does spot VIX have what it takes to break through the bottom of its six-month range and head down south of the 13 handle? My vote is yes, with a little persistent lack of action in the SPX. Today's paltry 10-point range for SPX is exactly what needs to happen on the short-term realized front in order to get SPX options traders to drop their equilibrium price set on implied vol. I'm not suggesting that all it will take is a day. But I also think that the push to higher highs in SPX price action, if blended with a breather period with some calm, is exactly the recipe that's needed if we're to see spot VIX take out the lows last seen in September '18. 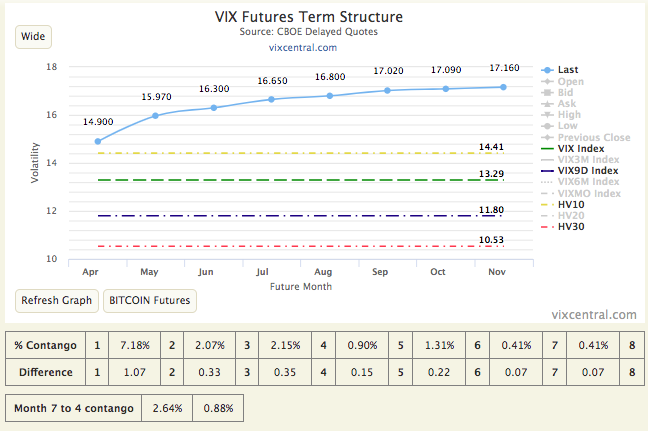 As a matter of fact, it was almost exactly this kind of setup that led to breaking through VIX=17 earlier in the year. 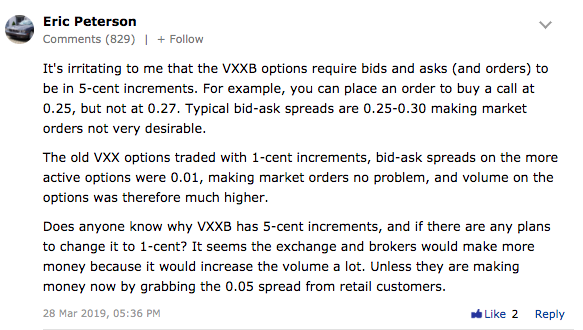 In the prior MVB, I wrote on VXXB options, to which Eric Peterson responded with a well-founded complaint about the nickel-wide options increments on this product, as opposed to the old VXX penny-wide increments. I thank him for bringing up this point, and would like to direct you to Alan248's helpful answer to this question.